With women increasingly delaying conception and child birth, the incidence of babies born with Down syndrome (DS) is one the rise. A baby born to a 30-year-old mother has a 1 in 1000 chance of being born with DS, but this increases to 1 in 400 when the mother is a 35-year-old and to 1 in a 100 by the time the mother is a 40-year-old. Of course this doesn’t go to say that DS is only related to the age of the mother as other factors contribute too. It is one of the most common chromosome abnormalities in humans and is also known as trisomy 21, a condition in which a person is born with an extra pair of genes, better explained as the child having 47 chromosomes in each cell instead of 46. The condition was first fully described in 1866 by a British doctor named John Langdon Down, after whom the disease eventually came to be known. This condition is typically associated with characteristic facial features which include a flat face, small ears, and eyes with an upward tilt and a small mouth with tongue sticking out, short stature, short necks and mild to moderate intellectual disability. The average IQ of a young adult with DS is sadly equal to that of a normal 8 or 9-year-old only. The physical and mental problems associated with DS vary widely and likewise the treatment and medical support needed for leading a healthy life. Though DS cannot be prevented, it can be detected early in the womb itself and pregnancy can be terminated in some countries. Parents of children have normal genes and the mutation in the children occurs just by chance. It’s a life-long condition that requires a lot of patience, care and support towards the children with DS to enable them grow up to enjoy health, happy and productive lives. Education and proper care can help improve the quality of their lives. Those children with mild DS can cope up in normal school classes but others may need specialized educational institutions for learning. These children also have poor immunity and generally reach their growth milestones such as sitting up, crawling, walking, speech, and self-care skills like feeding and dressing themselves, a little later in life. They have poor muscle tone in their body and babies may appear floppy. Such kids also bear the burden of being more prone to health issues such as congenital heart defect, leukemia, thyroid disease, pulmonary hypertension, hearing and vision defects, seizure defects and mental disorders to name a few. People with DS need regular medical evaluation so that complications can be addressed in time. 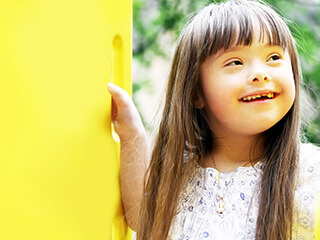 As there is no treatment for Down syndrome, all the family and society as a whole can do is to be as supportive as possible towards people with this condition.